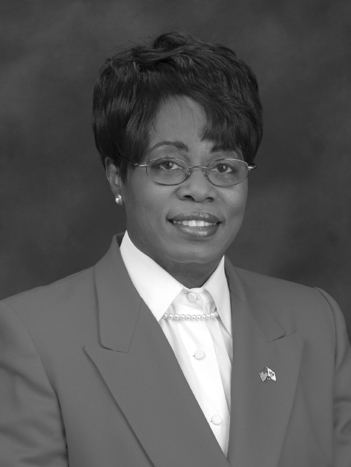 Wanda M. Austin, former president and chief executive officer of The Aerospace Corporation, is a leading architect for solutions to issues such as national security affecting the nation’s space prsograms. She is internationally recognized for her work in satellite and payload system acquisition, systems engineering, and system simulation. In 2015, President Barack Obama appointed her to he President's Council of Advisors on Science and Technology. She previously served on two White House commissions–the NASA Advisory Council and U.S. Human Space Flight Plans Committee–and was a member of the Defense Science Board. Dr. Austin assumed the presidency of The Aerospace Corporation—an independent, nonprofit organization with nearly 4,000 employees and annual revenues of more than $850 million—on January 1, 2008. Previously she was senior vice president of the company’s National Systems Group, which supports the national security space and intelligence community in the acquisition, launch, and orbital operation of advanced technology space systems and their ground data stations. She was senior vice president of Special Studies from January 1 to April 1, 2004, and from June 2001 through December 2003 was senior vice president of the Engineering and Technology Group, directing a staff of 1,000 engineers and scientists working in a wide range of space-related disciplines. Before being named senior vice president, Austin was general manager of the Military Satellite Communications (MILSATCOM) Division, where she was responsible for systems engineering support to the Air Force in the architecture, acquisition, development, and orbital operation of advanced satellite communications systems and programs. Previous to her assignment to the MILSATCOM organization, she was general manager of the Electronic Systems Division. Dr. Austin was a member of the technical staff at Rockwell International before joining Aerospace. Dr. Austin earned a bachelor’s degree in mathematics from Franklin & Marshall College, master’s degrees in systems engineering and mathematics from the University of Pittsburgh, and a doctorate in systems engineering from the University of Southern California. She is a member of the National Academy of Engineering, a fellow of the American Institute of Aeronautics and Astronautics, and a member of the International Academy of Astronautics. Dr. Austin has received numerous awards and citations. Among them are the National Intelligence Medallion for Meritorious Service, the Air Force Scroll of Achievement, the National Reconnaissance Office Gold Medal, the U.S. Air Force Meritorious Civilian Service Medal, the Air Force Space and Missile Systems Center’s Martin Luther King Spirit of the Dream Award, and the 2009 Black Engineer of the Year Award. She was inducted into the WITI (Women in Technology International) Hall of Fame in September 2007. In 2008, Dr. Austin received a Special Achievement Award from the 100 Black Men of Los Angeles. The American Institute of Aerospace and Astronautics awarded her its 2010 van Braun Award for Excellence in Space Programs Management. She has since received the Horatio Alger Award, the NDIA Peter B. Teets Industry Award, the USC Viterbi Distinguished Alumni Award, and the AIAA Goddard Astronautics Award.